We're on Dynamics 365 Online v9. We have almost 60 security roles, half of them custom. I'd like to delete the ones we've effectively "retired" and do not use. I tried this a few years ago and had problems when doing solution layer migrations so shelved this job but I feel like now is a good time to do it as we have similar named roles and stops any issues of the wrong role being assigned. Once the above is done, I am planning to move a solution with the security roles through our environments and then delete the "retired" security roles. Feel free to let me know if I'm doing anything wrong or have missed something off. If anyone has any experience doing this please let me know how you got on. Just wondering how it went? We are looking to do something similar. Making sure that the role isn't linked to a user or team is the most important step to do. You'll also need to do the 2nd step that Aaron mentions about removing the role from the app. If My Apps is missing from your sitemap, you can add it back in by following these instructions. @Aaron Back, MCSE​​ thanks for two points, appreciate it. @Mark Aston - You may want to check into a couple of things. First, if you go to Customizations and Customize the System, you can scroll down and see Security Roles on the left-hand side. Click this and you will see the list of Security Roles. 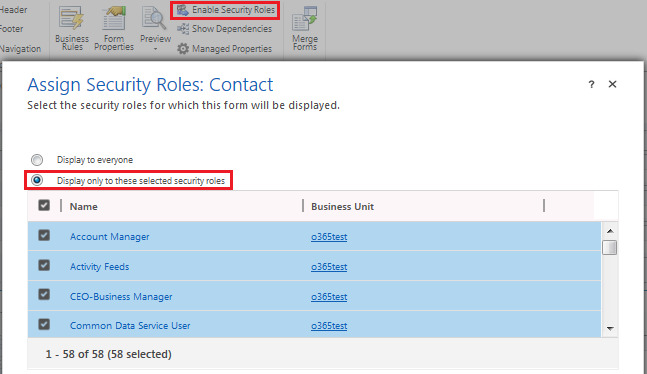 Select a role in the list and click on "Show Dependencies". This will help you identify anything the role is connected to. Second, in the list of dependencies, you may notice a name of an "app" that you may be using since you are on V9. These are the new Model-Driven Apps. To update the security roles tied to these apps, you need to navigate to "Settings" and then "My Apps". This will show you a screen with tiles for each app you have. Select the app and click on the 3 dots and select "Manage Roles". This will pop out a panel on the right-hand side with the Security Roles. Thanks for the help on this we will give it a go.